NOTE: Numerical values for yM may be defined in the National Annex. 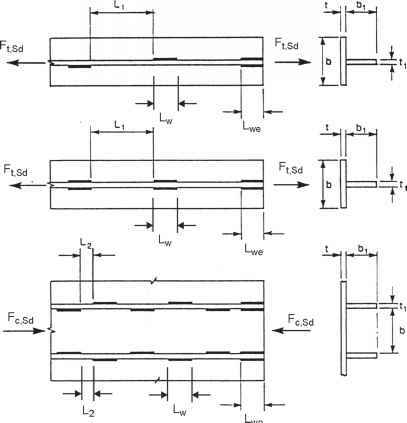 Recommended values are as follows: i>M2 = 1,25 ; yM3 = 1,25 for hybrid connections or connections under fatigue loading and yM3 = 1,1 for other design situations; jui = 1,0 ; 7ms = 1,0 ; yM6,ser = 1,0 ; jui =1,1. (3) Joints subject to fatigue should also satisfy the principles given in EN 1993-1-9. (1) The forces and moments applied to joints at the ultimate limit state shall be determined according to the principles in EN 1993-1-1. (1) The resistance of a joint shall be determined on the basis of the resistances of its basic components. (2) Linear-elastic or elastic-plastic analysis may be used in the design of joints. (3) Where fasteners with different stiffenesses are used to carry a shear load the fasteners with the highest stiffness should be designed to carry the design load. An exception to this design method is given in 3.9.3. (f) any model used is in compliance with the evaluation of test results (see EN 1990). (2) The application rules given in this part satisfy 2.5(1). (2) Where slip is not acceptable in a joint (because it is subject to reversal of shear load or for any other reason), preloaded bolts in a Category B or C connection (see 3.4), fit bolts (see 3.6.1), rivets or welding should be used. (3) For wind and/or stability bracings, bolts in Category A connections (see 3.4) may be used. (1) Where there is eccentricity at intersections, the joints and members should be designed for the resulting moments and forces, except in the case of particular types of structures where it has been demonstrated that it is not necessary, see 5.1.5. (2) In the case of joints of angles or tees attached by either a single line of bolts or two lines of bolts any possible eccentricity should be taken into account in accordance with 2.7(1). In-plane and out-of-plane eccentricities should be determined by considering the relative positions of the centroidal axis of the member and of the setting out line in the plane of the connection (see Figure 2.1). For a single angle in tension connected by bolts on one leg the simplified design method given in 3.10.3 may be used. NOTE: The effect of eccentricity on angles used as web members in compression is given in EN 1993-1-1, Annex BB 1.2. This European Standard incorporates by dated or undated reference, provisions from other publications. These normative references are cited at the appropriate places in the text and the publications are listed hereafter. For dated references, subsequent amendments to or revisions of any of these publications apply to this European Standard, only when incorporated in it by amendment or revision. For undated references the latest edition of the publication referred to applies (including amendments).